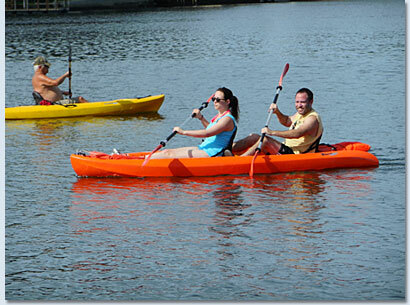 Kayaking is the most eco-friendly way to see Crystal River wildlife. Because you are able to paddle in places that larger boats are not able to get to and because kayaking is quiet, our birds and animals are not alerted to your presence. We have the clearest springs in North America and some of the best wildlife habitat. Not only will you possibly see manatees, but beautiful birds like osprey, herons, and egrets. You may also see dolphins, raccoons turtles, apple snails, and blue crabs while you paddle though our crystal clear waters. We also have large Tarpon that weigh up to 125 pounds that you can see and also hand feed right from the dock at Pete’s Pier. There are also a chance of seeing wild deer and pigs on some of the banks while passing in your kayaks. We also have a family of bald eagles that fly around our area, which is quite breathe taking to see. The manatees often like to “play” with kayaks. They have been known to push and sometimes just hold onto them while they look up at you! Our location is a short paddle to the popular Three Sisters, Jurassic and Hunter springs allowing you plenty of time for an extensive visit within the 3 hour standard Kayak rental period. Family Adventure Charters is located directly on the water with its own private dock that leads to the best spots in the Crystal River area to Kayak. We offer single and double kayaks (Tandem) all of our Kayaks are Sit-On-Top kayaks which is made by the company Lifetime. Our kayaks feature an open cockpit which allows for an easy entrance and exit into the kayak. Lifetime kayaks are made of high-density polyethylene (HDPE) plastic for light weight and durability they also have a very stable flat bottom which allows the kayak to track very well when paddling. Before renting our kayaks we make sure everyone watches a film that shows you what you can and cannot do while being out in the water with the kayaks. Our employees walk out each group and assist everyone into their kayaks so that they can get in with ease and no worries. Family Adventure Charters takes great pride in making sure everyone enjoys their time and most of all are safe when using our equipment. We do not have any age restrictions on children, there is room for a small child to sit. - Double Kayaks hold a max weight of 425 lbs. Length 10’6 (93.2m), Width 36’’ (91.4cm. Florida state law is Kids 6 years and under will need to wear a life vest at all times when in the kayak, we do have life vest for all ages if someone feels the need to wear one. Before entering the kayak, we go over how to use the kayak the proper way so that everyone feels comfortable and confident when using our equipment. We do provide each group with a water proof map that shows you the different springs and how to get back from each spot. If you would like a guided tour in the kayaks we can accommodate those requests at extra cost. “When kayaking with my family of 4 we encountered a manatee a friendly manatee that wanted to play with our kayaks by resting its head on the front of the Kayak. By law you are not able to touch the manatees from a vessel but it was still an amazing time we had site seeing around the area. 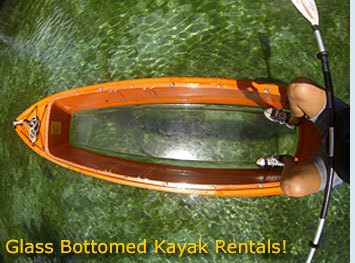 We highly suggest Family Adventure Charters when looking to rent kayaks for the day!"